Philadelphia Carpets is Shaw's oldest and broadest flooring line and one of the most respected brands in the industry. Established in 1946, Philadelphia Carpet offers a broad selection of carpets designed for today's busy lifestyles that are both beautiful and affordable. Sometimes, it's the little extras that are available in Philadelphia Carpet that make choosing easier. And sometimes, the little extras make a huge difference. Philadelphia Carpet R2X™ - uses Shaw's patented soil and stain repellent system* has been hailed as a new generation in carpet soil and stain resistance technology since its introduction in 2001. It's as much of an innovation today as the first carpet stain and soil treatments were fifteen years ago. Developed by Shaw's own Technical Services and Research and Development labs, the remarkable R2X system achieves total fiber coverage--from the top of the yarn to the bottom. 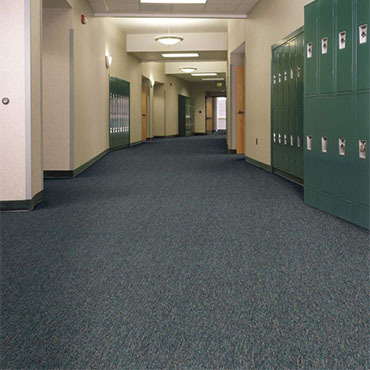 Philadelphia Carpet SoftBac® Platinum - In association with S.I. Flooring Systems, Shaw introduced SoftBac, a soft, flexible, carpet backing in 1997. The improved SoftBac Platinum was introduced just last year. Over 150 million square yards of the revolutionary flexible carpet backing have been installed with zero complaints for restretch. One industry observer wrote of SoftBac, "...on occasion, product introductions wind up doing more than we all expect." Comparing carpeting is easy with Shaw's carpet performance rating. On the carpet label of every residential style, you'll find an easy-to-use, easy-to-comprehend "Performance Rating." The scale is from 1 to 5, and it represents the carpeting's ability to withstand extended wear. A perfect rating of 5 means that after rigorous, industry-standard testing, the carpeting maintained the appearance of brand new carpet. Shaw makes comparing carpets as simple as possible. It's not practical to associate years with the carpeting durability rating. There are so many variable factors--area of the home, traffic patterns, number of inhabitants, level of proper maintenance, etc.--that what might be only 3 years of acceptable carpeting performance to one could be a lifetime to another. Western Carpet & Tile Co Inc.